I've had a couple of people inquire about a pattern for my shoe lacing quiet book page. Many times when I'm making a quiet book I don't take the time to create a pattern, this had proved to be a mistake seeing how I've already made four books. Rachel recently asked if I could come up with one for her. I agreed, but I only came up with a template. You can find the printable templates here, if that one doesn't work for you, try this link. There will not be a written set of printable instructions. I'll provide you with a brief set of instructions here below. First of all, most of the individual pieces are labeled, this will help you know what goes where. 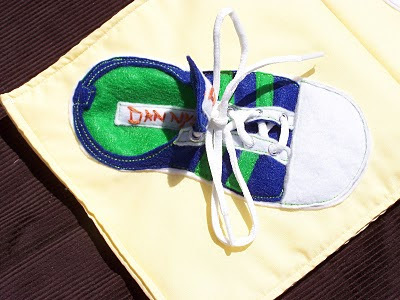 If you are adding personalized tags you will want to hand stitch them first. I used embroidery thread. Next you will want to attach small pieces to larger pieces before constructing the shoe completely, e. g. stripes to shoe, eyelets to small white strips, Strip to the shoe (on top of the stripes) labels to tongue and insole, and tab to the back of the shoe. Once the smaller details are in place you can attach the insole to the sole, the tongue and the top of the shoe to the sole. You can see my page for reference, all of the pieces are basically the same. Note: I did my best to recreate the shoe from this quiet book page, but I did make some tweaks. I thought that the shoe needed more sole, and that a larger curve in the instep would help it out significantly. If you put together the pieces and the stripes don't fit perfectly, or the sole is larger than you'd like, you can always trim them. So construct the shoe before attaching it to the page form. This way you will be able to modify the sole if needed. Hopefully this template will help you as you create your next quiet book. Feel free to contact me if you have any questions. Don't forget to check out my other links to Quiet Book Pages on the side bar. As with all of me templates and patterns they are for personal use only. Please do not sell items made by this template. Don't forget to sign up for the CSN Card Giveaway. It is open until October 10, 2010. I'm linking up here today. What a wonderful idea. I should make this (maybe get my sister in law who actually knows how to sew) for my son who needs to learn how to tie his shoe laces. You have some adorable things on here! I love them! I wanted to let you know that I recently started a "Handmade Tuesdays." I am featuring a tutorial (let me know if you ever want to be featured) and then am also going to have a linky at the bottom where people can link up previous tutorials they did. It can be from any time but the only rule is it cannot be linked up again. I am also going to be randomly featuring etsy shops as well because not everyone can make things! So please link up on Tuesday! i love the entirety of these quiet books which unfortunately my little one is too old to play with now! but they are brilliant, and it's cool that you're sharing the how-to for the various pages! great stuff! I saw you on craft gossip, thank you so much for sharing! Unfortunately, I see that there is a fee to download the template for this page. :( If, by chance, I am mistaken or if there is another way to gain access to this template without paying money, I'd love to find out. Please email me with tips. Thanks so much!